Most of us are familiar with Com2us‘ offerings into the Android App Marketplace. Most of their popular games are ports of iPhone games, which lend to their cross-platform appeal. Ultimately, the company doesn’t have much to lose by delving into both markets, and neither does the consumer: we have less app envy and more things to distract us on our morning commutes. I picked up Caligo Chaser on a recommendation from a friend; he knew I liked 16 bit side-scrolling beat-em-ups and was spot on with his recommendation. Caligo Chaser takes the concept and adds RPG elements to it, which is quickly becoming a standard among developers who want to add some longevity to their games. It doesn’t seem to hinder the formula at all: you equip weapons and powers, and then smack the living crap out of things until they die. There’s a quest ripped straight from World of Warcraft: yellow exclamation mark means a quest is available, yellow question mark means you can turn it in. The art and sound are all top-notch, though some might be turned off by the anime-inspired graphics. There’s a bit of a stylistic difference between the sprites and portraits, but I’ll give them a pass in the name of “artistic license”. Levels and monster sprites are great, and fit my Milestone’s resolution great. Overall the graphics are top-notch, aside from some resolution issues. As you hit monsters damage is represented by per-hit numbers, giving you a feeling of satisfaction every time you land a big crit and see a huge number flash across the screen. Hits also add to a combo counter, which can be maintained with successful attacks, and is reset when a meter reaches zero. A higher combo means bonuses to damage and critical rates. 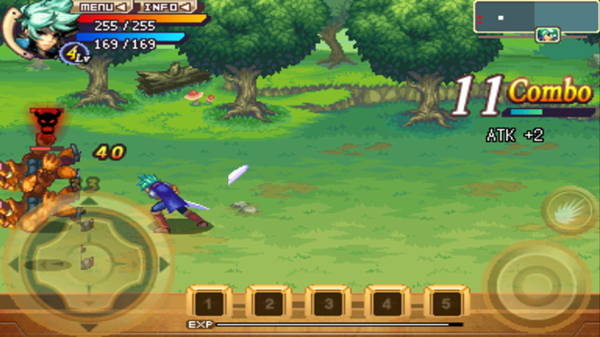 Along with melee attacks, your character is able to perform different types of magic. Ranging from abilities that are able to be charged to fiery uppercuts of doom, there’s skills that fit differing playstyles. When it comes to controls, this game is best played on the Droid. I’ve had horrible experiences with on-screen joysticks and buttons, so knowing that I have the tacticle sensation of a keyboard is a huge plus. However, the controls aren’t customizable, which I really don’t enjoy – the choice to map the D-Pad to the X, Z, D and C keys have been a source of endless frustration for me. The fact that the game detects the ability to use a keyboard, yet still keeps the on-screen joystick and buttons to block out portions of the battlefield irks me. If they were going to take the time to develop support for keyboards, why couldn’t they just throw in one more option to disable the other options? Ultimately Calico Chaser’s quite an addictive title; I enjoy playing it from time to time, but the fact that Com2us seems very content to just develop games for the iPhone and then slap a new coat of paint for Android leaves a bad taste in my mouth. When I play the game, I don’t feel like it was truly developed for my phone; like I said above, some screens have resolution problems (like the title screen) which leave things looking stretched and ugly. I think this might be something lost when the developer had to jump platforms: more models of phones mean more variance in hardware specifications. I can see how this might be a problem, but if they want to enter our market, why shouldn’t they put forth the effort? At $4.99 (while their site reports it at $2.99), it’s not a bad price for a game as full-featured as this. However, it takes up nearly 20mb on my Milestone, which was something I wasn’t quite prepared for. Prepare to possibly get the dreaded “Space running low” message if you’re heavy on the apps. Matt Demers is a Toronto writer who thinks it isn’t too much to ask to be able to go “left” and “up” at the same time. You can find more of his writing at his personal site.